Pinot Meunier is a lesser known grape variety in general but can definitely make great wine. Also known as “black riesling”, this grape is also used in Champagne production along with chardonnay and pinot noir, often not mentioned much to give more attention to the other more well-known varieties. It is also not known to age well (generally), hence also not being well known. A straight pinot meunier red wine, made well, has great body and flavour intensity, but with a dry, slightly ‘old fashioned’ feel to it. It is comparable to pinot noir, but often with less tannin and a higher acidity level (pairing well with food). Now Best’s from Great Western (Victoria) happen to be sitting on some of the oldest Pinot Meunier plantings in the world! Dating back to 1867… Everyone should try a great Pinot Meunier at least once. 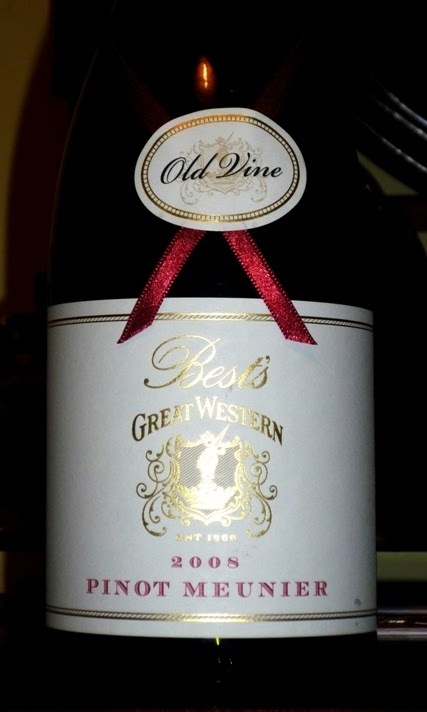 Best’s Old Vine Pinot Meunier 2008 is a very interesting fine wine aged in French oak. It has cedar, fragrant spices and red and black cherries on the nose. On tasting I get bright red fruit flavour and fresh acidity, but with complexity, leanness in structure and flavour, slightly grippy tannins and a great finish. Great with small, delicate tapas or pate. Rrp about $65. The current 2008 vintage will cellar at least another 10 years. Definitely want to try this wine Sarah. Alcohol content?